Register is one of the leading online business web hosting companies. It specializes in all of the essential devices and services a small business enterprise needs. These devices and services include management services, web designing services, and top of it all global domain name registering. In fact, Register is well reputed as a user-friendly domain name registration service provider. For more than 10 years, Register has been providing millions of users with the best possible web hosting solutions. The services include aspects of web hosting like private domain registration, email packages, website establishment, SEO designing and development, and Ecommerce services. Register offers many services and products ranging from several do-it-yourself devices to fully customized offerings. A team of competent customer care executives are working 24/7 to help each customer when required. Register is the perfect resource for all those small business organizations that are in need of establishing graceful web presence. Being a business owner, you can completely depend on this site for all of your web hosting needs. To build a dynamic web site for running your business successfully or provide your existing site with powerful Ecommerce tools, you can opt for featured web site design services that include do-it-yourself web sites, build-it-for web sites, and customized professional web design services. Make an impressive online presence; visit The Learning Centre link for free tips, know-how, and ideas. All services offered by the merchant are priced very reasonably. Promote your existing site; opt for any of the featured packages like Simple Site Submission, Advanced Site Submission, and Advanced Site Submission with Expert Advice. 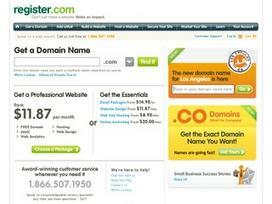 With Register you can register a domain name for your website with a suitable extension. The Domains section also offers other facilities like Advanced Domain Search, Premium Domains, Private Domain Registration, Web Site Forwarding, and Bulk Registration. You can transfer your existing domain to the merchant's, too. Register offers several email packages helping both personal and professional users to promote their brands. The list includes Basic Email, Professional Email, Business Email 10+Boxes, Business Email 25+Boxes, Hosted Microsoft Exchange, and Windows Live Mail. Create a dynamic web presence with any of the Web Site packages like Do-It Myself, Build-It-For-Me, and Build My Website-Custom, as per your requirement and budget. The store also offers different Web Hosting services like Essential Web Hosting, Professional Web Hosting, and Premium Web Hosting. Its Ecommerce solutions are best for establishing and maintaining online stores. Register is sincerely and genuinely dedicated to its customers. You will get plentiful offerings, throughout the year. Share what you think about Register, and your favorite ways to save there! If you desire to increase your know-how just keep visiting this web site and be updated with the hottest news posted here. Wow, fantastic weblog format! How long have you been blogging for? you made running a blog glance easy. The whole look of your website is magnificent, let alone the content material!